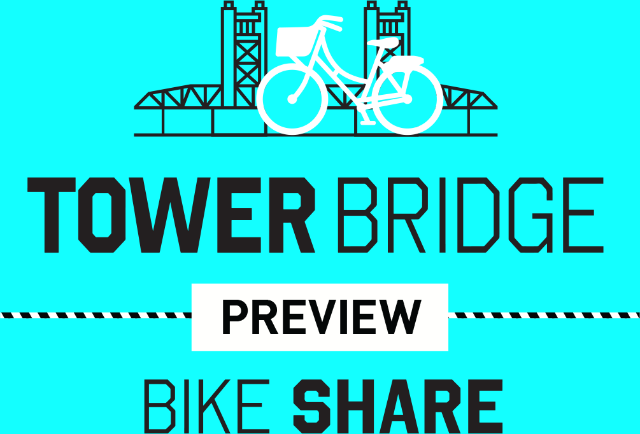 The Tower Bridge Preview bike share is going to have some expansion in about a month, up to five new hubs on the Sacramento side. I had heard previously that there would be no expansion before full roll-out, which is no sooner than November and quite possibly far beyond that since a major corporate sponsor has still not been identified. The best news is that one of the hubs will be at Sacramento Valley Station, the train station, and it will be a large hub. This is mentioned in Melanie’s StreetsblogCal post: Eyes on the Street: Sacramento’s First Cycle Track Appears Near Amtrak, and I also heard the same when I ran into Phillipe at the 18th & Capitol hub, doing maintenance and re-balancing. It was a major oversight to not include a hub at the station, but that will be fixed! I talked with the other person who is regularly parking a bike at the station, for a commute into the Bay Area a few days a week. That person said they love the system, use it for this and other trips, but wished there were a regular hub at the station. The bike has always been there at the end of the day to be used for the return trip. I’m parking a bike at the station for nearly every Amtrak trip I take (to the Bay Area, to Truckee, and to South Lake Tahoe). Since I’m often gone more than one day, other people sometimes check out the bike, which is fine with me since I live close enough to walk. If you are using the system, you noticed a few days ago that the display screens on each bike changed, with some additional information and tips. The ability to unlock a bike with a RFID card, meaning the Connect Transit Card, is prominent. But not yet implemented. SoBi and the ConnectCard are working out the details. Card use will initially just be for unlocking, in the same manner that the Clipper Card can unlock a Ford GoBike in the Bay Area system, but you will have to have a Social Bicycles account and bike use will be charged to the account rather than the card. The display also mentions unlocking with a phone number, but I’m pretty sure that is not implemented either. Please share stories here about your use of the bike share. Since that company, SocialBicycles, and the partners, SACOG and the two cities, have said next to nothing about the success and challenges of the bike share, it is even more important that we talk with each other. Oh, and if you are looking for employment, SocialBicycles is hiring an Operations Manager for Sacramento. I just tried linking my Connect Card to SoBi and it worked fine. As you say, it uses the money in your SoBi account, not RT. In fact, I’m guessing that it will work with any (one) RFID card you have in your wallet. My guess is that the card ID simply acts as an alias to your SoBi account number. I wonder if a drivers licence has an RFID chip that would work. I’ll have to try that out. After trying many times to link my Connect Card, I was finally able to last night. The menu system on the bike I was using had changed, and offered the card linking, whereas previously when I placed my card on the keypad, it gave me an invalid number error. Perhaps not all the bikes had been updated yet. I have several other RFID cards I had considered using, but it made sense to use Connect Card, because I always have that one with me when I’m in town. I imagine people from out of town might want to use a card from their home area.